California Paddle Board Tours is the #1 place to find the experience of a lifetime right here in Sunny San Diego. We also host Kayak Rental San Diego and specialize in exceeding your paddleboarding expectations. Whether it is your first time or you are a seasoned pro — our guests all absolutely love their time spent with our experienced instructors and guides. Anyone can come down and give paddle boarding or Kayaking a shot. The boards we rent are what we call “Cruiser Boards” and are very wide and stable. Our Kayaks are all double kayaks which can allow any couple to share in the activity on the same craft. Our guides run a circuit tour around Beautiful Harbor Island and along Spanish Landing Park. A still water marina tour with a break on a nice sandy beach at Spanish landing is the ultimate in Paddling bliss. We have a Half-Circuit and a Full Circuit Option on every tour. Those who can successfully complete the Full Circuit Tour Receive a FREE LUNCH on us(almost necessary for replenishment). Never been paddleboarding before? No problem! There's a reason this sport has gained popularity so quickly across all ages and fitness levels. If you'd like to learn some of the basics of paddleboarding, and tips to help you out, this video will give you some helpful knowledge beforehand so you'll feel a bit more comfortable the first time you get on the board. 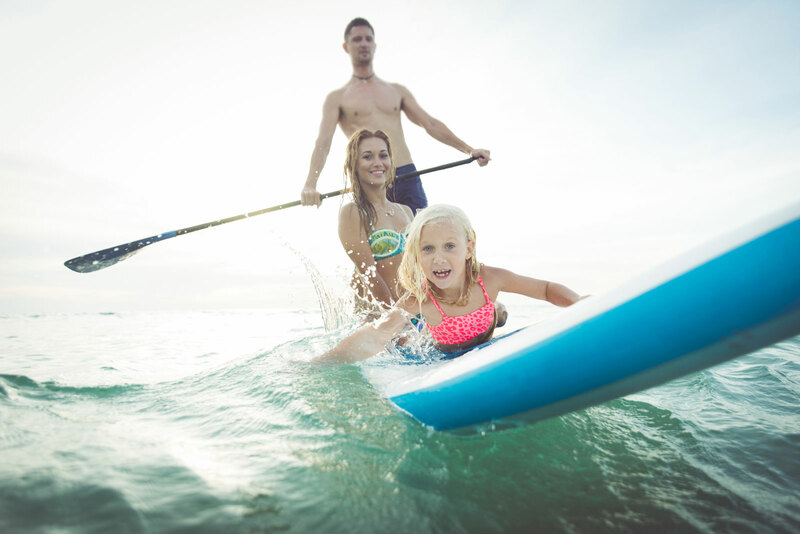 Paddleboarding is a fun and relaxing way to spend time by yourself, relaxing peacefully on the water, but is also great for couples, groups, and families! See the sights together, race, play, just have fun! Paddleboarding is a total body workout you can do while having fun outdoors! It burns lots of calories and works your arms, shoulders, back, core/abs, and legs. Best of all, you can do it at your pace, and it's no-impact, so it's great for people of all abilities and fitness levels! The sound of lapping water; the gentle sway of the board as you glide through the water; fresh sea breeze, and warm sun on your face... there's no better way to clear the mind and refresh the senses. The exercise you get while paddleboarding is great for your health too! The combination of strength and cardio exercise is good for joint mobility, balance, and overall health. It also increases endorphin levels, which makes you feel better and stimulates the immune system. COME ENJOY A PADDLE WITH US!